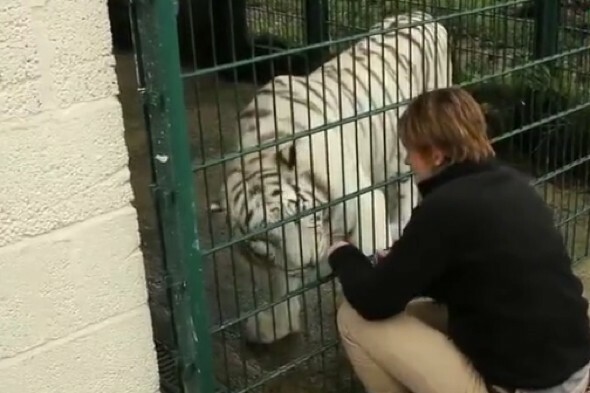 A rare one-eyed white tiger who lives at an Isle of Wight zoo has had her sight saved by groundbreaking surgery. Zena, 15, who has lived at the zoo since she was a cub in 1996, lost her right eye to glaucoma six years ago. And a cataract growing over her left eye was threatening to leave her completely blind without intervention. Cue optical specialist Rob Lowe who, with his team of vets, used highly intricate surgery never before performed on a tiger to remove the offending cataract. Charlotte Corney, the owner of the zoo in Sandown who also hand-reared Zena as a cub, told The Sun that she ‘couldn’t be happier’. White tigers have been extinct in the wild since 1958.